London 2012 Olympic Games start in 10 days and with the media noise slowly gaining tempo, advertiser engagement and interest is also on the rise. As a run up to the event, here’s looking at some topical brand executions through our 'Olympic Series'. 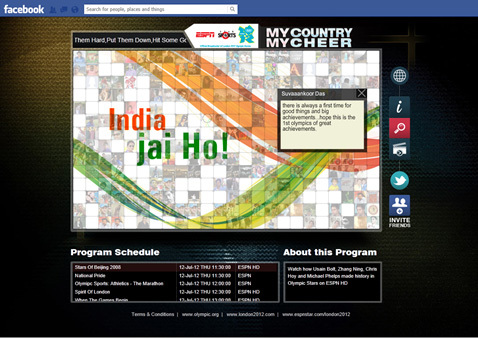 Starting the series with the official broadcaster for the Game, ESPN Star Sports, which is promoting its association through a Facebook application ‘My Country My Cheer’ created for Asian fans in Malaysia, Singapore and India. The Cheer application is a great platform for fans to register their support for Athletes. All they need to do is claim a pixel on the Indian Flag themed Cheer Wall and post their message. The three countries have their own local Flag walls. Moderated posts appear with the fan’s Facebook display picture. Some lucky prolific fans can also walk away with ESPN Star Olympic themed merchandise. The cheer wall looks great and the UI is compact and complete with sharing options, links to various Olympic websites and 30 second player video vignettes. The application also has a Friend Finder that tells you if any of your Facebook Friends have already posted a cheer. The idea itself is not novel but the execution is good. The ideal hangout for the Sports Fan, the ESPN Star Brand Page on Facebook, hosts polls, exclusive photo & video content and TV schedule updates.